So, you’ve decided that letting your property out is the way forward...how do you get the house ready for a potential tenant and ensure a successful let? Here are the top ten things to do before your tenant sets foot over the threshold. Appearances really count when you’re letting out a property, so spend some time making sure that the interior is immaculate, and if there’s a garden, tend to it so that the tenants don’t think that the first thing they will have to do is hire a gardener to sort out the mess. Make sure that any little jobs are done in and outside the house, and make the place as welcoming as possible. Before anyone moves in, make sure that you know where you stand – a good landlord should make a list of all the fixtures and fittings within the property, and their condition (any scratches etc) so that the tenant can agree it. This way, if there’s any damage there’s no argument about the damage being caused before the tenant moved in. It saves time when it comes to deposit refunds if there’s a problem. Make sure that you leave the relevant manuals for all appliances in the property, to avoid tenants bothering you when they can’t work the gas cooker or central heating. Make sure that anything you leave is in good working order as well, clean the oven, test the heating and bleed radiators. 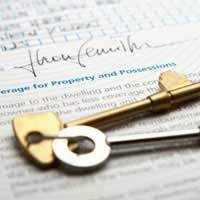 It’s a legal requirement to get gas safety checks carried out at any property you’re renting out, so make sure the relevant paperwork is in place and a copy of any inspection certificate is available for the tenant’s peace of mind. You also need to obtain an energy performance certificate (EPC). As from April 2018, there will be a requirement for any properties rented out in the private rented sector to have a minimum energy performance rating of E. Make sure that electrical installations and appliances are safe. If the property is being let as furnished, you also need to make sure that all of your furniture complies with fire safety regulations – if it doesn’t have the correct label, you can’t leave it behind. Leave a list of contact numbers for your tenant, including your own. It’s also helpful if you leave an instruction list of how to deal with anything that might crop up in the property, such as a burst pipe or a suspected gas leak. Before a new tenant moves into your property, go round and take all the meter readings. Make sure that the utility companies and council tax office know that there will be a new tenant, unless you are including this in the rent. Give the gas, electricity and water readings to the service providers so that they have a record of the leaving readings. If you’re moving out of the property, arrange for your mail to be redirected too. If the property has fire extinguishers or blankets, explain to the tenant how to use them. If there’s a burglar alarm, it’s also very important that you show the tenant how to operate it before they attempt to do it themselves and set everything off...and it goes without saying that you’ll need to give them the combination! Show them how to test the smoke and carbon monoxide alarms and emphasise the importance of testing the alarms regularly. Make your new tenant welcome by putting together a welcome pack for them. It could just be useful information such as the nearest doctor and chemist, bin collection information and a selection of take away menus for that fraught first few days in the house...or you could go further and leave them a vase of flowers, some milk in the fridge and some teabags. Try and arrange a meeting with the tenant so that you establish a relationship from the start. Once they’ve settled in, arrange to call in and discuss any issues – making it clear that this is both of your opportunity to let each other know what you expect from the tenancy arrangement. A face-to-face meeting helps both parties feel that they know where they stand and it’s your chance to open lines of communication between you and your tenant. If your life is hectic enough and you really don’t want the hassle of doing everything yourself, you could consider handing the finer details of your property letting over to a property management company.